As a self-confessed health food junkie, I am always on the look out for nutritious alternatives to existing snacks and just generally other yummy goodness to supplement my diet with. Also, now that Joe's started cycling again he needs good solid healthy fuel to keep him going on those long rides and prevent him from turning into a grumpy hungry monster when he gets back home afterwards (believe me, it's not pretty!!)! Anyway, the other day I saw a 3 pack of 'original' 9Bars the other day and thought I'd try them out. If you haven't tried these bars yet I implore you to do so! Like Nakd bars they're made by cold-pressing the ingredients together. This removes the necessity for unnatural and unhealthy binding ingredients and processes and in doing so ensures that everything contained inside is nutritious and free of hidden nasties. I would add a caveat to my enthusiastic ranting though and ask that if you're trying to lose weight, please bear in mind that these bars not a 'light snack' but more of a 'meal in a bar' as they are quite calorie and fat (as well as nutritionally) dense at 277 Cals and over 20g of fat (although definitely classified as 'good' fat :-) ). So unless you've allowed for it in your daily calorie allowance, or missed a meal and need to refuel, or are engaging in something relatively active etc it would be wise to not eat a whole bar in one sitting! I say 'wise', though actually it's pretty much almost impossible... to avoid scoffing the lot at once, I've taken to cutting a bar in half lengthways into 'fingers' and taking one with me a day to work for my mid-morning/afternoon snack! Don't just take it from me though, if you'd like to try a bar for free to see what you think then click here and fill in your details, you won't regret it, trust me! 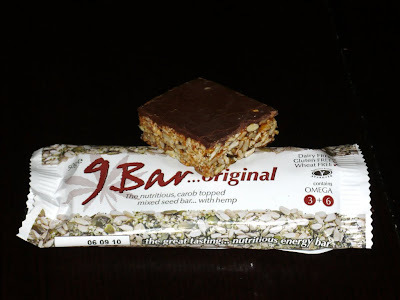 I love and adore the 9 bars but rarely have them as they are so calorie dense and yep, I scoff the lot. as it so happens I have a stock of these bars of yumminess in my cupboard so will get cutting! Thanks for your great comments on our 9Bars, always nice to get some positive feedback on what we are doing and sounds like you understand what the bars are all about. I found your blog because I noticed on Google analytics that we have had 15 referrals this week from your site so had to find out more. and enjoyed dipping into your world, let me know how you go on with your own versions, maybe you can teach us something! Hi Mark, great to hear from you! Thanks for the feedback but your products really do speak for themselves, they're delish!! Glad to have sent some business your way, though from the sounds of things the bars are pretty well known amongst those with an interest in good natural tasty fuel. Quick update on short term goal...! Fruit and nut bars - take 1!